Este próximo Otoño saldrá el cómic basado en ARMS, pero antes en Mayo sacarán una historia gratuita en los EEUU, el cómic será como un torneo de unos contra otros. Earlier this year, Nintendo released ARMS™, a fighting game exclusive to Nintendo Switch™. Today, ahead of New York Comic Con and The Nintendo World Championships 2017, Dark Horse is excited to announce a new publishing program for the energetic and strategic fighting game. The latest installment in Dark Horse and Nintendo’s partnership, ARMS is preceded by The Legend of Zelda™: Hyrule Historia, The Legend of Zelda™: Art & Artifacts, The Art of Fire Emblem Awakening, and The Art of Splatoon™. ARMS™ is a revolutionary fighting experience for all ages and skill levels. Utilizing Joy-Con™ motion controls, players can throw punches and guide them midflight to hit agile fighters, avoid incoming attacks with dashes, or trampoline high into the air to rain down fists from above. Players can select from a colorful cast of fighting champions and try to win the coveted championship belt in the ARMS Grand Prix. 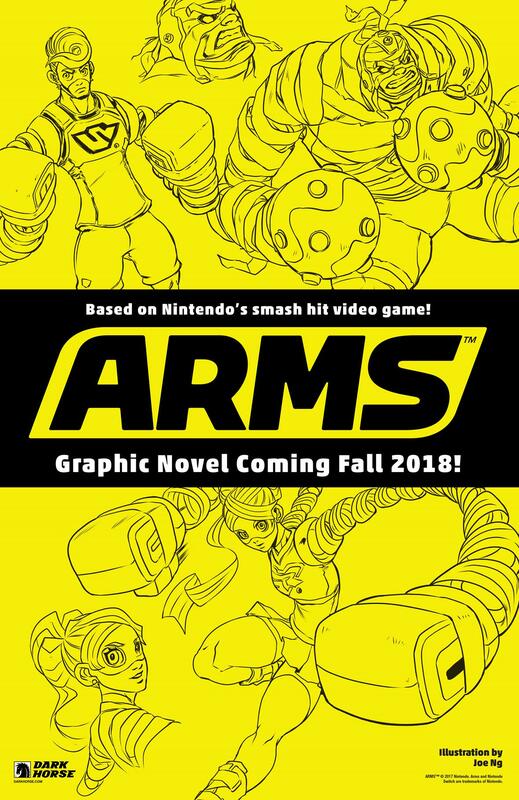 Dark Horse will publish the first of the ARMS graphic novels in Fall 2018.